Recently, 35 professionals sought to understand what’s been called the greatest and most complicated crisis of our generation. They focused on exploring how refugees around the world are using tech to create more agency and better futures in the December SF Bay Area Technology Salon on How Can 22 Million Refugees Use Technology to Create Better Futures? The discussion was led by experienced field workers and professionals Alex Alden, Tenzin Seldon, Breana Zwart from YouTube Impact Lab as well as Amanda Alampi and Osama Bhutta from Amnesty International, moderated by director Elizabeth Kountze. Highlighting examples of refugee-led projects that work, the group explored some of the sensitivities of the issues, such as questions about asylum, internet surveillance, and the danger of injecting cash resources to refugees. If you start doing this, everyone knows. Once the money is received, the people who get the money immediately become targets, pointed out a discussion leads. The group borrowed the statement “nothing about us without us,” (coined by the disabilities movement) to frame the discussion around the role technology is playing in creating agency and possibility. Discussion lead Tenzin Seldon, who fled with her family from Tibet, pointed out the uniqueness of each refugee’s situation. The crux of the conversation centered around a central challenge made more challenging by the complexities of each situation: How can we help foster movements led by refugees, that has the power of the world behind it? On the other hand, an Amnesty International representative pointed out, “We need to keep top of mind: “How do we protect people? They are fleeing their countries, they are in new situations and unsure – want to get the future moving, want to get working, maybe they are not comfortable being activists, or it may put their lives or families at risk. The group explored platforms that work, and those that help lead to social cohesion. For example, Amnesty International’s iWelcome focuses on empathy building. It encourages community members and residents to shine a light on moments of compassion and refugees as economic stimulants. It offers a space for people who want refugees to helping say, “We are ready to welcome you,”. YouTube’s Impact Lab partnered with Doctors without Borders for relief efforts, and offers free resources for nonprofits and social groups, and offers people the tools and learnings so that people can tell their own stories through video more effectively. Participants celebrated Uganda-based Opportunigee, International Refugee Assistance Project , faith-based organizations at home and abroad (for more on this, see participant Catherine Cheney’s January article for Devex), and Communicating with Disaster Affected Communities (the CDAC network). 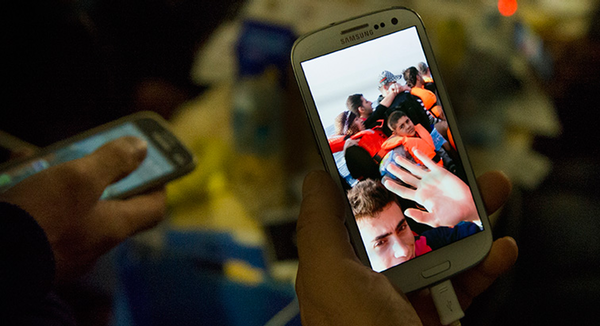 Some resources focus on the user journey: such as News that Moves, an Internews initiative (no longer active) that was used by refugees fleeing through Greece on their journey to Germany, and Tarjim.ly, a Facebook messenger translation service that connects volunteers to refugees. And others on improving experience in the host country such as Kinstep, a B2B platform that matches pre-vetted immigrants with employment directly in the community.